The Hunt Deep-V offers superior characteristics that give it the ability to navigate rough seas at higher speed with more safety and comfort than any other hull design. The Hunt Deep-V is admired for its soft, dry ride in rough seas, the ability to track straight up, down or across waves with fingertip steering, dynamic stability at speed without loss of stability at rest, and efficient running that minimizes fuel consumption. The value of these characteristics is not limited to pleasure boating. 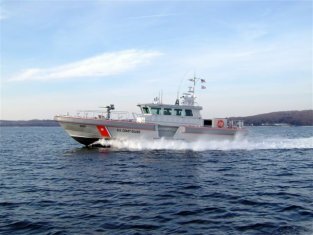 Indeed, the majority of pilot boats serving commercial ports in North America are Hunt designs. Here are boats – and people – who must go out in any weather, deliver pilots to ships quickly and safely, 24/7 all year long. For the same reasons, our Navy and Coast Guard also rely on Hunt Deep-V’s. At Hunt, we believe running is believing. Take a test drive and compare Hunt to every other boat you’ve driven; you’ll find there’s no comparison. We love an excuse to get out on the water to demonstrate the impressive performance of the Hunt Deep-V. The naval architects at C. Raymond Hunt and Associates answer common questions about the newest generation of Hunt Deep-V hulls. At-rest or static stability is largely dependent on vertical center of gravity and waterline beam. Early Deep-Vs were designed to float with their chines clear of the water for speed, so they were narrow at the waterline, skinny, for more speed. The Bertram-31 and others of that vintage were light and fast for their time but did roll from chine to chine when at rest in a beam sea. Today we address that problem by designing each hull to have its chine in the water at rest for about half of its waterline. This creates a wider beam on the water and a stable boat. Today’s Hunt Deep-Vs do not roll any more than flatter bottoms of the same beam. It’s also important to understand that hard chine boats are generally more stable than round bilged boats. This is because the hard edge of the chine is more resistant to rolling than a nice soft round edge. A hard chined boat equal in waterline beam to a round bilged boat will be stiffer. Static stability is only part of the picture however. Another component in planing boats is dynamic stability. And it is an important one. The same forces that lift a planing boat above the water also stabilize the boat and counteract rolling. Displacement boats have no such benefit, thus the need for fin stabilizers and flopper stoppers. Planing boats gain stability once on plane. They actually are stiffer running at speed. The Deep-V has the added advantage due to the deadrise because the planing forces are always working to right the boat. These forces are acting normal to the surface of the hull through the center of lift. On flat bottomed hulls these forces are acting normal to the bottom also, but do not counteract a roll. Are Deep-V’s hard to push? This is another old tale that we can surmise comes from the generality that most Deep-Vs are highly powered to go fast so they use a lot of horsepower. Any boat trying to go fast requires a lot of power. We do not see much variation in efficiency from hull to hull if we compare boats of similar dimensions and weight. Differences in hull shape, beam, chine shape, struts, rudders, propellers, all those things together do make a difference, but overall, there is not much difference in speed between well designed planing hull shapes. Note the emphasis. A few years ago Grady White asked us to design some planing catamarans. We looked at a lot of catamaran hulls and sea trialed many before we designed the Grady cats. We discovered that the same speeds were attained by mono-hulls and catamarans if the weights and horsepower were equal. The major factor in efficiency and speed is weight. Heavy boats are slower and need more power. Deadrise has little effect on efficiency when looking at real boats in the water as opposed to theoretical tests. So many other factors can make a much bigger difference. Compare for yourselves. Look at the boat tests in the magazines. Even if these are not the most scientific, they can be used for comparison. Compare the fuel efficiency of Hunt Yachts to other boats, and you will see we are as good as or better than most. Also note that planing hulls don’t have to be any less efficient than displacement hulls. Aren’t all Deep-V’s the same? Not at all. The Hunt Deep-V is the original, and it also has evolved. While it is still very similar to Ray’s original concept, we have improved it and tailored it for every application from 10 ft. PWCs to 110 ft. Motoryachts. Our 50 years’ experience has taught us how to make it better. If you look closely at hulls at a boat show or boatyard you can easily pick out a Hunt hull. Our hulls have more deadrise forward, finer waterlines, robust and sharp edged chines and strips, and generous flare. Many other hulls carry transom deadrise too far forward giving a harsher ride, let interior accommodations define hull shape above and below the waterline, have soft easily molded chines and strips that are far less effective in knocking down spray and holding the boat steady at sea. We put the ride first and the housekeeping second, so on the unpredictable ocean, you will be comfortable and confident at all times, in all seas. Deadrise is the angle between horizontal and the hull bottom athwartships. Typically Hunt designs have a deadrise angle aft between 18 and 24 degrees. You often hear that Hunt hulls have constant deadrise. This is not true. The angle increases gradually as you go forward to about 55-60 degrees at the bow. The more deadrise you have the softer the ride. Many V hulls will have 20 degrees aft and 20 degrees forward, ie: constant deadrise. This makes for a hard ride. Sharper sections and finer waterlines make for a softer ride. Too sharp however and the bow will plunge deeply into a sea and throw water or worse, dig in and cause the boat to broach. Isn’t less deadrise better for slower speeds? Not necessarily. Deadrise is less important than other critical charateristics, notably the run and buttocks lines aft, the right propeller/gear ratio match, trim and weight. Deep-Vs make superb displacement boats. With more hull and displacement under the water than flat bottomed boats, they handle better, go straighter with less effort, and can be more stable than traditional displacement hulls due to the hard chine. Chines, liftstrips, spray rails, etc. What do they do? Primarily their job is to shave water off the hull. A planing boat is trying to out run the ocean, leave it behind, and climb on top, so we want to get the water off the hull quickly. Water attached to the hull means drag and pushing it aside makes waves. Both are wasted energy. A big bow wave may be dramatic but it takes a lot of HP to push water around like that, and the top of that bow wave usually blows back in your face! We want to snuff out bow waves. That is the job of the chine and the lift strips (as we call them) and spray rails. The primary chine is where the topsides meet the bottom; where the hull turns the corner. It defines the running surface. It runs bow to transom. We vary its size and location depending on several factors. We add liftstrips forward on the bottom and run them aft at varying lengths. These strips peel the water off reducing wetted surface cutting skin friction (drag) and redirect the water traveling up the hull to add a lifting component that in turn has two benefits: it helps lift the boat out of the water, and it adds stability. A survey of spray rails at a boat show will turn up every possible shape. Some are so small and round they do nothing. Others are under water all the time, and also do nothing. Some actually are indented into the hull. The water just passes these by. Hunt strips are large and sharp to effectively do their job giving the boat great control, dynamic stability, and a dry ride. Do propeller tunnels improve efficiency? First a tunnel needs to have the right shape, subtle soft curves and edges, low entry angle, and parallel sides to disturb the flow to the prop as little as possible and create minimal turbulence. Still, even with the best shape, there is a loss of lift aft because the tunnel roof runs uphill toward the transom. Some benefit is gained because the tunnel allows a lower shaft angle and this improves propeller efficiency and reduces cavitation which is wasted energy. The primary benefit of a tunnel is less draft. Boats with trim tabs must have a problem. No! Just the opposite in fact. All planing boats should have tabs, just like modern airplanes have flaps. Trim tabs or the newest device, the interceptor, allow you to adjust a boat’s trim to sea conditions. There is no one perfect trim angle for all conditions. Up wind you want to keep the bow down a bit to soften the ride into a chop. Downwind you want the bow up some to prevent digging in and broaching. We design our boats to run with a bow up attitude and use tabs to trim the bow down. If you have a boat that naturally runs flat you can not get the bow up. That is fine as long as you never venture out beyond the breakwater. You can use trim tabs to correct for off balance loads, and to add lift so you can keep your boat on plane longer at lower speeds for greater fuel efficiency and range. In this mode the wake is flatter too. What is good fuel efficiency? First, think in miles per gallon, not gallons per hour. The latter means nothing until you factor in the distance traveled. In larger yachts ½ nmpg is quite decent mileage. On average if you can get 1 nmpg you are doing well, and 2 + nmpg is great. Check out some magazine seatrial data and it will surprise you. You will find some go-fast boats that get better mileage than some slow trawlers. Typically a planing boat will be most efficient once it is on plane but as you go faster you will burn more and more fuel for smaller increases in speed. You can lower the planing threshold and thus improve efficiency by lowering the trim tabs (this adds lift). Many newer electronically controlled engines give you a fuel consumption read out so you can find the sweet spot. Why do boats heel over when running? If they have a list due to weight imbalance at rest, that can be maintained once underway. The boat will run heeled over toward the list. Another reason can be asymmetry in the bottom. It might actually be different port and starboard. It is hard to make hulls perfectly symmetrical. The original Bertram 31 was that way. It could be caused by a piece of equipment that is on one side but not the other such as a large seawater intake or transducer. One trim tab might be down more than the other. Misalignment of rudders or lower units could be the culprit. Then there are the dynamic forces. The curved forward hull sections can actually experience the same suction that happens on a sail (or a curve ball) and this suction will pull a boat over. Wind acting on the superstructure can also heel the boat into the wind via sail-like suction. Ventilation of rudders and drive units can result in a dramatic and sudden heeling action at speed. And of course sometimes we see more than one of these gremlins acting up at the same time! Why are Hunt rudders wedge shaped? Because at high speed the flow around the rudder is separating from the surface; it goes turbulent and will not stay attached to an airfoil shape as it will say on a slower speed vessel like a sailboat. So, we don’t want a low drag airfoil shape because the narrow trailing edge will be working in a void of turbulent water. The helmsman will experience a mushy feel in the wheel, and the boat won’t respond until he puts the helm hard over. The wedge shape fills in the void, so when the helm is turned, the wedge rudder immediately finds solid water to work against. The principle is similar to a wing or Kamm tailed race car.